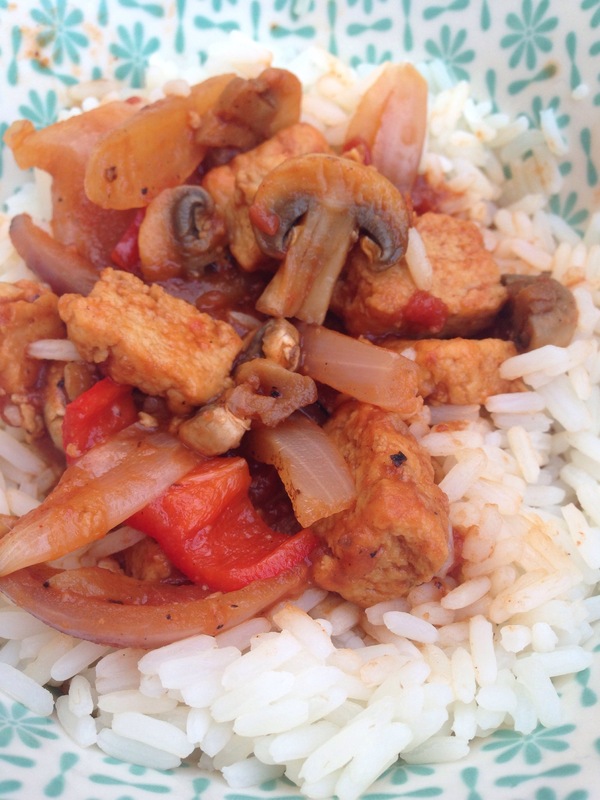 Slimming world diet coke quorn recipe! Thought I would post about the ‘new’ vegetarian slimming world recipes I have been making but vegetarian versions. Diet coke chicken is a popular ‘syn free’ dinner. I made this with quorn which is a ‘free food’ in the slimming world diet. Easy peasy to make! Fry the onion and garlic briefly. Add in the mushrooms pepper and Quorn cook until lightly browned. Mix tomatoes, HP sauce and diet coke in a jug and mix together, using diet coke as an ingredient seems very strange I have to admit! The recipe actually is supposed to be Worcester sauce but as that is not vegetarian friendly I opted for HP sauce. Then add to the quorn and pepper mixture add the paprika and cook until it reduces down add salt and pepper to taste. I served this lovely sweet and sour barbecue tasting dish with boiled rice!